Bayer 04 Leverkusen bowed out of the UEFA Champions League at the last 16 stage after a 0-0 draw away to Atletico Madrid saw the Spanish side go through 4-2 on aggregate. After Leverkusen conceded four away goals in the first leg, Tayfun Korkut’s men needed a three-goal win in the Spanish capital if they were to reach the last eight. Kevin Volland fired just wide inside five minutes and Julian Brandt, on the counter attack, and Javier ‘Chicharito’ Hernandez, with a snapshot over the bar, also had presentable chances for the visitors in the first half. But Leverkusen survived some anxious moments in defence too and were indebted to goalkeeper Bernd Leno for saving from Angel Correa and Koke before half-time. Correa and Antoine Griezmann both came close to getting what would have been a killer goal for Atletico early in the second half but Leverkusen kept pushing forward. If ever there was a sign it was not going to be their night, it came in the 68th minute. Brandt and Volland (twice) were denied by Atletico keeper Oblak at close range and Hernandez shot just wide – all in a matter of seconds. Kevin Kampl and substitute Leon Bailey also forced saves late on but it was not to be. Showing plenty of energy and guile, midfielder Kampl looked the most likely to unpick a very stubborn home defence. 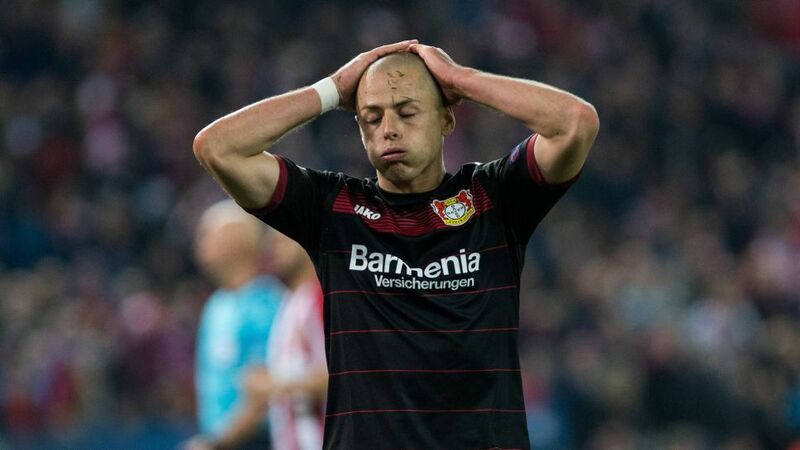 Leverkusen have still never won a last 16 tie in the Champions League and came nowhere near as close as two years ago, when they were knocked out on penalties at the same venue. But a determined display here will give them confidence for the final 10 league matches of the season, when they will try to plot a path back to Europe from 10th in the table. Atletico: Oblak – Vrsaljko, Godin, Gimenez, Lucas – Thomas, Koke, Saul, Carrasco (Savic 71') – Griezmann, Correa (Gaitan 65'). Leverkusen: Leno – Hilbert, Jedvaj, Dragovic, Wendell – Bellarabi, Baumgartlinger, Kampl, Brandt (Bailey 78')– Hernandez (Mehmedi 81'), Volland (Aranguiz 88').